Happy Holidays from your friends at K-Kat! To show our appreciation for your business, we are having a 25% off sale on all products through December 31st, 2018. Warm wishes to you and your kitties! This entry was posted in News on November 27, 2018 by admin. Scoops are back in stock! It’s THE Scoop is back in stock and available for order! Thank you for your patience while it was temporarily back-ordered. Hello K-Kat Visitors! Thanks for stopping by!! K-Kat is all about developing creative solutions to common problems in pet ownership, and sharing them with the world. We hope you love our products and that they improve your life with your pets! This entry was posted in News on June 18, 2015 by admin. THANK YOU to all of our wonderful Kickstarter Backers, who helped us raise $37,720 in one month for our It’s THE Scoop campaign! We raised 377% of our goal, which allowed us to place our first large order of scoops with our manufacturer. All of the Kickstarter rewards have been delivered, and THE SCOOP is now in stock and available for purchase, shipping daily! Happy Scooping!! Welcome to our new website! You can now Order Our Products quickly and easily through our online store! It’s The Scoop has achieved great success on Kickstarter and continues to be sought out by cat owners looking for a better tool for their litter boxes. It will speed up your scooping, reduce the dust, and make your life easier. Finally, the scoop you always wanted, and it’s strong enough to last a lifetime! 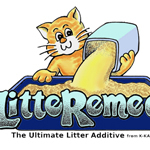 If you experience continual odors or excessive dust with your litter box, you should use LitteRemedy, the litter additive that will solve your litter problems. LitteRemedy absorbs the all of the dust, making it much healthier for both you and your cat, who may inhale harmful dust when digging in your litter. 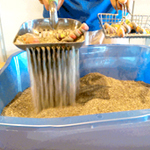 It makes litter clump hard around urine and feces, keeping your litter box clean indefinitely. We now offer a 5-pound Sample Size of LitteRemedy for those who would like to try it first!